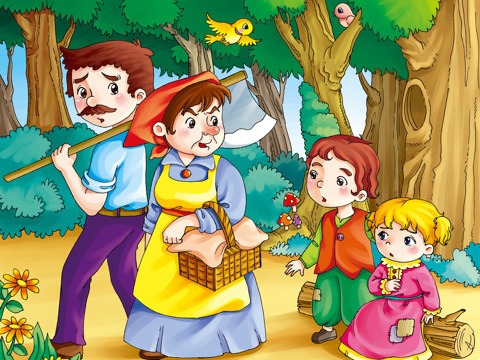 ONCE upon a time there dwelt on the outskirts of a large forest a poor woodcutter with his wife and two children; the boy was called Hansel and the girl Grettel. He had always little enough to live on, and once, when times were bad, they had to get by with one piece of bread and butter each. One night, as he was tossing about in bed, full of cares and worry, he sighed and said to his wife: “What’s to become of us? how are we to feed our poor children, now that we have nothing more for ourselves?” “I’ll tell you what, husband,” answered the woman; “early to-morrow morning we’ll take the children out into the thickest part of the wood; there we shall light a fire for them and give them each a piece of bread; then we’ll go on to our work and leave them alone. They won’t be able to find their way home, and we shall be rid of them.” “No, wife,” said her husband, “that I won’t do; how could I find it in my heart to leave my children alone in the wood? The wild beasts would soon come and tear them to pieces.” “Oh! you fool,” said she, “then we must all four die of hunger, and you may just as well go and saw the boards for our coffins”; and they argued and argued, until he agreed that they must get rid of Hansel and Grettel. “But I can’t help feeling sorry for the poor children,” added the husband. The children, too, had not been able to sleep for hunger, and had heard what their step-mother had said to their father. Grettel wept bitterly and spoke to Hansel: “Now it’s all up with us.” “No, no, Grettel,” said Hansel, “don’t fret yourself; I’ll be able to find a way to escape, no fear.” And when the old people had fallen asleep he got up, slipped on his little coat, opened the back door and stole out. The moon was shining clearly, and the white pebbles which lay in front of the house glittered like bits of silver. Hansel bent down and filled his pocket with as many of them as he could cram in. Then he went back and said to Grettel: “Be comforted, my dear little sister, and go to sleep: God will not desert us”; and he lay down in bed again. At daybreak, even before the sun was up, the woman came and woke the two children: “Get up, you lie-abeds, we’re all going to the forest to fetch wood.” She gave them each a bit of bread and said: “There’s something for your luncheon, but don’t you eat it up before, for it’s all you’ll get.” Grettel took the bread under her apron, as Hansel had the stones in his pocket. Then they all set out together on the way to the forest. After they had walked for a little, Hansel stood still and looked back at the house, and this maneuver he repeated again and again. His father observed him, and said: “Hansel, what are you gazing at there, and why do you always remain behind? Take care, and don’t lose your footing.” “Oh! father,” said Hansel, “I am looking back at my white kitten, which is sitting on the roof, waving me a farewell.” The woman exclaimed: “What a donkey you are! that isn’t your kitten, that’s the morning sun shining on the chimney.” But Hansel had not looked back at his kitten, but had always dropped one of the white pebbles out of his pocket on to the path. When they had reached the middle of the forest the father said: “Now, children, go and fetch a lot of wood, and I’ll light a fire that you may not feel cold.” Hansel and Grettel heaped up brushwood till they had made a pile nearly the size of a small hill. The brushwood was set fire to, and when the flames leaped high the woman said: “Now lie down at the fire, children, and rest yourselves: we are going into the forest to cut down wood; when we’ve finished we’ll come back and fetch you.” Hansel and Grettel sat down beside the fire, and at midday ate their little bits of bread. They heard the strokes of the axe, so they thought their father was quite near. But it was no axe they heard, but a bough he had tied on a dead tree, and that was blown about by the wind. And when they had sat for a long time their eyes closed with fatigue, and they fell fast asleep. When they awoke at last it was pitch dark. 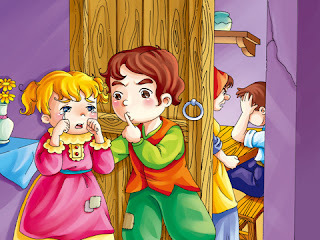 Grettel began to cry, and said: “How are we ever to get out of the wood?” But Hansel comforted her. “Wait a bit,” he said, “till the moon is up, and then we’ll find our way sure enough.” And when the full moon had risen he took his sister by the hand and followed the pebbles, which shone like new threepenny bits, and showed them the path. They walked on through the night, and at daybreak reached their father’s house again. They knocked at the door, and when the woman opened it she exclaimed: “You naughty children, what a time you’ve slept in the wood! we thought you were never going to come back.” But the father rejoiced, for his conscience had reproached him for leaving his children behind by themselves. Not long afterward there was again great dearth in the land, and the children heard their mother address their father thus in bed one night: “Everything is eaten up once more; we have only half a loaf in the house, and when that’s done it’s all up with us. The children must be got rid of; we’ll lead them deeper into the wood this time, so that they won’t be able to find their way out again. 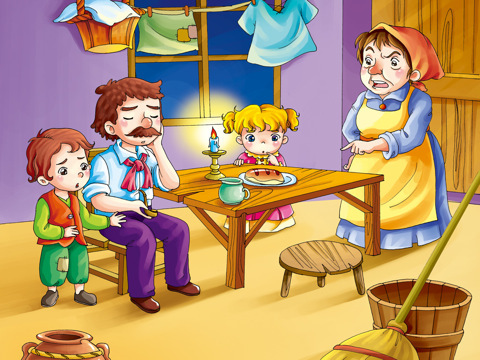 There is no other way of saving ourselves.” The man’s heart smote him heavily, and he thought: “Surely it would be better to share the last bite with one’s children!” But his wife wouldn’t listen to his arguments, and did nothing but scold and reproach him. If a man yields once he’s done for, and so, because he had given in the first time, he was forced to do so the second. At early dawn the woman came and made the children get up. They received their bit of bread, but it was even smaller than the time before. On the way to the wood Hansel crumbled it in his pocket, and every few minutes he stood still and dropped a crumb on the ground. “Hansel, what are you stopping and looking about you for?” said the father. “I’m looking back at my little pigeon, which is sitting on the roof waving me a farewell,” answered Hansel. “Fool!” said the wife; “that isn’t your pigeon, it’s the morning sun glittering on the chimney.” But Hansel gradually threw all his crumbs on the path. The woman led the children still deeper into the forest farther than they had ever been in their lives before. Then a big fire was lit again, and the mother said: “Just sit down there, children, and if you’re tired you can sleep a bit; we’re going into the forest to cut down wood, and in the evening when we’re finished we’ll come back to fetch you.” At midday Grettel divided her bread with Hansel, for he had strewn his all along their path. Then they fell asleep, and evening passed away, but nobody came to the poor children. They didn’t awake till it was pitch dark, and Hansel comforted his sister, saying: “Only wait, Grettel, till the moon rises, then we shall see the bread-crumbs I scattered along the path; they will show us the way back to the house.” When the moon appeared they got up, but they found no crumbs, for the thousands of birds that fly about the woods and fields had picked them all up. 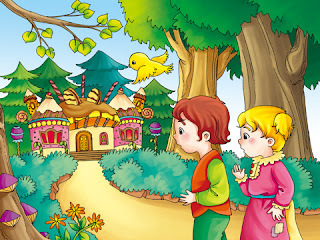 “Never mind,” said Hansel to Gret- tel; “you’ll see we’ll find a way out”; but all the same they did not. They wandered about the whole night, and the next day, from morning till evening, but they could not find a path out of the wood. They were very hungry, too, for they had nothing to eat but a few berries they found growing on the ground. And at last they were so tired that their legs refused to carry them any longer, so they lay down under a tree and fell fast asleep. and went on eating, without putting themselves about. Hansel, who thoroughly appreciated the roof, tore down a big bit of it, while Grettel pushed out a whole round window-pane, and sat down the better to enjoy it. Suddenly the door opened, and an ancient dame leaning on a staff hobbled out. Hansel and Grettel were so terrified that they let what they had in their hands fall. But the old woman shook her head and said: “Oh, ho! you dear children, who led you here? Just come in and stay with me, no ill shall befall you.” She took them both by the hand and let them into the house, and laid a most sumptuous dinner before them–milk and sugared pancakes, with apples and nuts. After they had finished, two beautiful little white beds were prepared for them, and when Hansel and Grettel lay down in them they felt as if they had got into heaven. The old woman had appeared to be most friendly, but she was really an old witch who had waylaid the children, and had only built the little bread house in order to lure them in. When anyone came into her power she killed, cooked, and ate him, and held a regular feast-day for the occasion. Now witches have red eyes, and cannot see far, but, like beasts, they have a keen sense of smell, and know when human beings pass by. When Hansel and Grettel fell into her hands she laughed maliciously, and said jeeringly: “I’ve got them now; they sha’n't escape me.” Early in the morning, before the children were awake, she rose up, and when she saw them both sleeping so peacefully, with their round rosy cheeks, she muttered to herself: “That’ll be a dainty bite.” Then she seized Hansel with her bony hand and carried him into a little stable, and barred the door on him; he might scream as much as he liked, it did him no good. Then she went to Grettel, shook her till she awoke, and cried: “Get up, you lazy-bones, fetch water and cook something for your brother. When he’s fat I’ll eat him up.” Grettel began to cry bitterly, but it was of no use; she had to do what the wicked witch bade her. Early in the morning Grettel had to go out and hang up the kettle full of water, and light the fire. 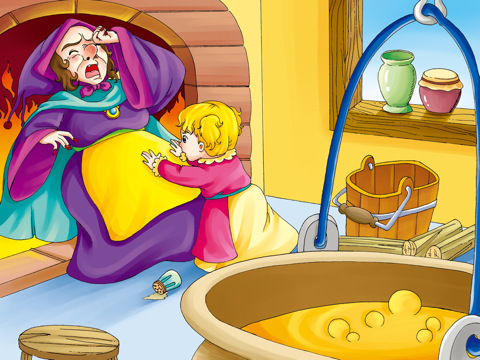 “First we’ll bake,” said the old dame; “I’ve heated the oven already and kneaded the dough.” She pushed Grettel out to the oven, from which fiery flames were already issuing. “Creep in,” said the witch, “and see if it’s properly heated, so that we can shove in the bread.” For when she had got Grettel in she meant to close the oven and let the girl bake, that she might eat her up too. But Grettel perceived her intention, and said: “I don’t know how I’m to do it; how do I get in?” “You silly goose!” said the hag, “the opening is big enough; see, I could get in myself,” and she crawled toward it, and poked her head into the oven. Then Grettel gave her a shove that sent her right in, shut the iron door, and drew the bolt. Gracious! how she yelled, it was quite horrible; but Grettel fled, and the wretched old woman was left to perish miserably. The duck swam toward them, and Hansel got on her back and bade his little sister sit beside him. “No,” answered Grettel, “we should be too heavy a load for the duck: she shall carry us across separately.” The good bird did this, and when they were landed safely on the other side, and had gone for a while, the wood became more and more familiar to them, and at length they saw their father’s house in the distance. Then they set off to run, and bounding into the room fell on their father’s neck. The man had not passed a happy hour since he left them in the wood, but the woman had died. 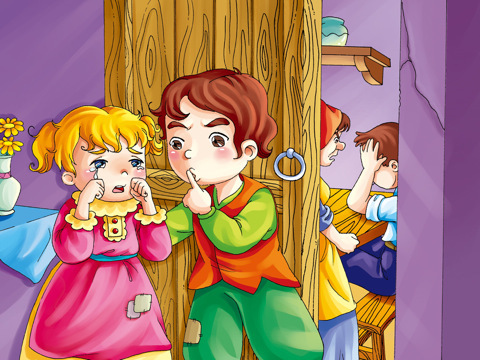 Grettel shook out her apron so that the pearls and precious stones rolled about the room, and Hansel threw down one handful after the other out of his pocket. Thus all their troubles were ended, and they lived happily ever afterward.